Early robotic hands were developed in part to mimic human grasping, but mostly to function in industrial environments where speed and force of operation were primary objectives. More recently, some robot hand R&D has focused on closely emulating the human ability to pick up; manipulate; and move small, delicate objects in unstructured environments outside the factory safety cage. Many of these robots are being developed for use with humans, either in industrial environments, or as service robots for the elderly or disabled. This requires robots that are smaller, safer, and human-aware at some level. 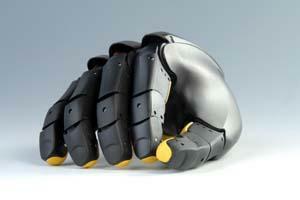 Engineers developing the newer generation of robotic hands have re-thought the approach to hand design. Many have started with a higher-level view that attempts to emulate multiple integrated human biological systems, not only motor movements. The newer generation of robotic hands closely models the human hand’s kinematics with a similar form factor, tactile and sometimes optical sensors, and high degrees of freedom (DOF) counts. Many have industry-standard interfaces and can be used as a tele-operation tool or mounted on a range of robot arms as part of a robot system. Some are commercially available, some were developed as proof-of-concept, and some are still in R&D.